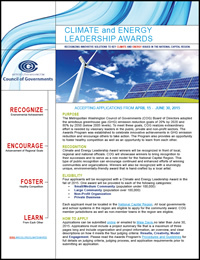 The Metropolitan Washington Council of Governments (COG) created the Climate and Energy Leadership Award to recognize organizations in the region for their pursuit of environmental opportunities and stewardship in line with greater regional greenhouse gas reduction goals. This program highlights and encourages leading practices in a broad range of climate solution in the National Capital Region (NCR). Join the friendly competition! Climate and Energy Leadership Awardees will be recognized in front of local, regional and national officials. COG will showcase awardees to bring recognition to their successes and to serve as a role model for the National Capital Region. This type of public acknowledgment can encourage continued and enhanced efforts of communities and organizations. Awardees will also be presented with a unique, environmentally-friendly award that is hand-crafted by a local artist. Visit the Awardees web page to learn about the past award recipients. Each applicant must be located in the National Capital Region. All local governments, member jurisdictions as well as non-members towns in the region are eligible to apply for the community award. Please read the Awards Program’s Procedures and Guidelines for full details on judging criteria, judging process, and application requirements prior to submitting an application. Applications can be submitted online or emailed to Maia Davis no later than June 22, 2016.